The Halsey Taylor WM14ABL-Q Water Cooler is an electric refrigerated wall-mounted unit. Delivers 14.0 GPH of 50°F water at 90°F ambient and 80°F inlet water. Fountain has stainless steel basin with removable drain strainer. Bubbler is two stream, moundbuilding type. Separate valve and automatic stream regulator can be mounted within cabinet. Refrigeration system employs high efficiency, positive start compressor using R134A non-pressurized tank with totally encapsulated insulation and be controlled by positive sensing thermostat. 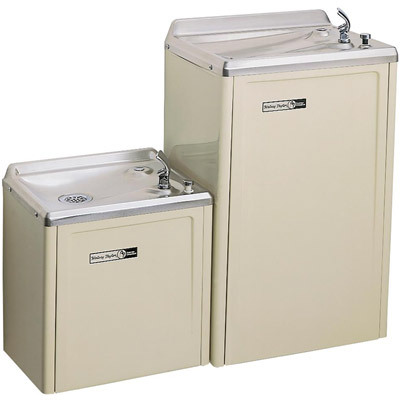 Unit is certified to NSF/ANSI 61 and meets requirements of the Safe Drinking Water Act. Unit complies with ARI Standard 1010. Heavy-gauge vinyl clad steel. Resistant to wear, moisture, perspiration, heat, and sunlight. Optional Stainless Steel is available.